ATTICA, Ohio (June 17, 2016) - For the first time in his career, NASCAR Sprint Cup Series regular Kyle Larson visited Attica Raceway Park, returning to his sprint car roots for the first round of Ohio Sprint Speedweek presented by Cometic Gasket with the Arctic Cat All Star Circuit of Champions. 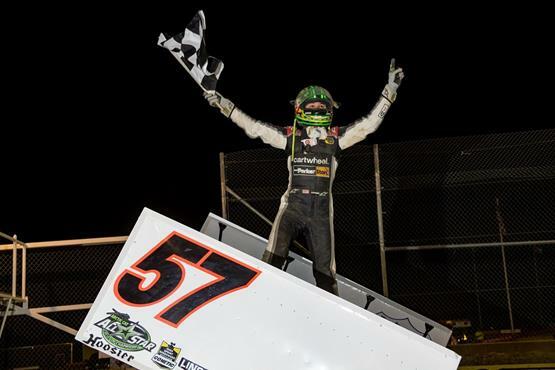 Larson, who is certainly no stranger to Arctic Cat All Star competition, proved to the standing-room only crowd that visiting a facility for the first time creates no distraction, capturing the Ohio Sprint Speedweek opener for a $5,000 payday. The Elk Grove, California, native took command of the 40-lap feature program on lap five and never looked back, leading Byron Reed and Chad Kemenah to the final checkers. Kyle Larson started fourth on the main event grid, taking command officially during a lap five restart over early leader Byron Reed. “Young Money” made the winning move on the bottom of turn two, capitalizing when Reed slipped up the race track just after the restart. Larson pulled even with Reed down the backstretch, ultimately setting up a successful slide job attempt in turn three. Despite encountering traffic on several occasions, even making contact with a car during an attempt to put the driver a lap down, Larson kept his position at the front of the field and drove forward. The Arctic Cat All Star victory was the third of his career. “I’ve never raced here before, but always wanted the chance to,” explained Kyle Larson in victory lane. “It’s pretty cool to get to victory lane. Ohio Sprint Speedweek presented by Cometic Gasket will continue on Saturday evening, June 18, at Waynesfield Raceway Park in Waynesfield, Ohio. Wooster, Ohio’s Sheldon Haudenschild earned the Ohio Sprint Speedweek presented by Cometic Gasket victory at Waynesfield in 2015. Haudenschild held off Aussie invader and pole sitter James McFadden for the $5,000 top prize, followed by Tim Shaffer, Randy Hannagan, and Steve Kinser. Pit gates are scheduled to swing open at 3:00 pm on Saturday afternoon. A mandatory drivers meeting will be conducted at 5:45, followed by warm ups at 6. Racing is scheduled to hit the highbanks at 7 o’clock, sharp. Those seeking additional information regarding round two of Ohio Sprint Speedweek presented by Cometic Gasket at Waynesfield Raceway Park should visit Waynesfield on the Web at www.waynesfieldmotorsportspark.com. Cometic Gasket, Inc., is a leading worldwide supplier of gaskets and engine sealing solutions for the Automotive Performance, Powersports, Original Equipment and Remanufactured Engine Industries. Housed in a 70,000 square-foot, state-of-the-art R&D and manufacturing center in Concord Township, Ohio, Cometic Gasket has maintained its deep roots in the powersports industry while expanding to service the Domestic Automotive, Sport Compact, V-twin, Marine, Diesel, Agricultural, Industrial and Stationary Power markets. Today, Cometic Gasket offers over 85,000 SKUs, shipping gaskets and engine sealing solutions across the globe.